Current scientific studies demonstrate that effective linking of the different systems of the brain during the learning process improves the transfer of knowledge into long term memory. Brain-friendly learning techniques are designed to maximise this advantage. 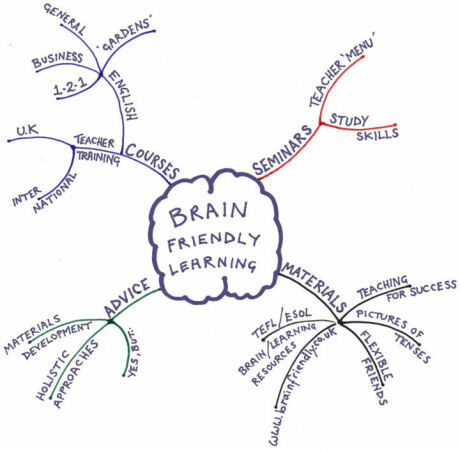 Brain-friendly learning and Brain-friendly publications offers a selection of materials and seminars which will assist teacher organisations, schools, companies and individuals to improve the effectiveness of their teaching/learning. Welcome to the brain-friendly revolution! Can we be better teachers/learners by getting more of the brain involved? What skills can be acquired to help us remember things? How can we create an optimum mental and physical environment for learning? What is the role of 'stress', 'music', 'age', 'self-esteem' in learning? What are the practical applications of ideas about Learning Styles, Multiple Intelligences, unconscious processing? These are just some of the issues addressed by Brain-friendly seminars and courses. Seminars are designed for TEFL/TESOL teachers but can be adapted. Click Dates for details of training in the UK and elsewhere.